In December of 2008, with major wars raging in Afghanistan and Iraq, our national debt stood at 40 percent of our nation's Gross Domestic Product (GDP), that is to say, our debt was equivalent to the value of forty percent of our entire national economy, a figure that, despite its size, was only SLIGHTLY higher than the figure on average for the ratio of debt to GDP each year since the war in Viet Nam. By December of 2012, just four years later, (and just six months from today), that figure will have risen to the level of SEVENTY percent of our national economy! This skyrocketing surge in our nation's debt in the past four years alone is due to the grotesque fact that in EACH of those years our government HAS BORROWED MORE THAN A TRILLION DOLLARS (a yearly average of 1.2 trillion) to cover its "spend like there's no tomorrow" extravagance. The INCREASE in public indebtedness TO THE SUM CLOSE TO FIVE TRILLION DOLLARS OVER THE PAST FOUR YEARS represents a staggering new burden strapped on the backs of those who do pay taxes, today and tomorrow. (About, half of America's adult citizens pay no federal income tax at all). Only a lunatic could look at these figures and "stay cool." Remember that a TRILLION represents a THOUSAND BILLIONS. The full significance of this geyser of spending with its attendant debt was explored in a recent editorial in the Wall Street Journal. May I share the editorial with you here. The CBO's long-term budget outlook notes that federal debt held by the public-the kind we have to pay back-will surge to 70% of the economy BY THE END OF THIS YEAR. That's the highest share of GDP [Gross Domestic Product] in U.S. history except for World War II, as the nearby chart indicates, higher than during the Civil War or World War I. It's also way up from 40% in 2008 and from the 40-year average of 38%. AND IT'S RISING FAST. CBO says that ON PRESENT TREND the national debt will hit 90% of GDP by 2022 [just ten years from now]. [Within the next four years after that] it then balloons to 109% by 2026-that would be the all-time WWII peak-and approaches almost 200% of GDP by 2037. We have never been deficit scolds, preferring to focus on the more important policy priorities of economic growth and spending restraint. But the Obama era is taking America to A PLACE IT HAS NEVER BEEN! INSIDE OF A DECADE the country will have a debt-to-GDP ratio well into the 90% to 100% DANGER ZONE where economists say the economy begins to slow and risks mount. CBO notes with its famous dry wit that this level of debt increases "the probability of a sudden fiscal crisis, during which investors would lose confidence in the government's ability to manage its budget and the government would thereby lose its ability to borrow at AFFORDABLE rates." How bad is it? In the absolute worst-case scenario, CBO says debt would exceed 250% of GDP in 2035. At that point, the CBO's economic model breaks, because so much debt is so far outside "historical experience" and the CBO's "assumptions might no longer be valid." This scenario assumes the Bush-Obama tax rates DON'T expire as scheduled and that tax collections CONTINUE TO HOLD to the post-1972 historical average of 18% of GDP. It also assumes that the phantom CUTS TO ENTITLEMENT SPENDING that Congress builds into the budget baseline DON'T happen in practice, AS THEY NEVER DO. Perhaps CBO's most important warning concerns the vagaries of interest rates. Even long-term interest rates are at historic lows, as investors flock to Treasurys as a safe haven in a world of uncertainty. This has dramatically reduced the U.S. government's funding costs, but that will not be true forever. The budget OUTLOOK is based on the PROJECTION that the real INTEREST RATE on public debt will NEVER EXCEED 2.7%. But IF interest rates rose 0.5 percentage points HIGHER each year than CBO projects, CBO says debt would hit 215% of GDP in 2037, [25 years from now], rather than 199%. The compounding growth of INTEREST payments would need to make up---people with heart conditions should stop reading here-some 30% of federal spending and 10% OF THE ENTIRE ECONOMY. 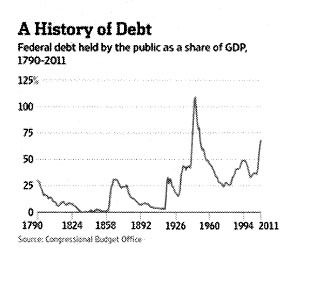 Every 100 basis point rise in the cost of government borrowing results in nearly $1 trillion in NEW debt. The development that explains why debt is so much higher today than during the great national crises of the past is the ENTITLEMENT STATE. With OBAMACARE, CBO explains that federal spending on health care will RISE from 5.4% of the economy today to 10.4% over the next quarter-century. Ponder that one: That 93% increase means one out of every 10 dollars spent will flow through one transfer program or another-and that's transfers FOR HEALTH CARE ONLY. Throw in Social Security and interest on the debt, and BY 2025 [just 13 years down the road] THERE'S NO TAX REVENUE LEFT TO DO OTHER THINGS government is supposed to do. Forget about building roads and funding scientific research. The entire defense budget would be deficit-financed. The biggest weakness in CBO's analysis is its pessimistic estimate of economic growth. The budget gnomes assume an annual growth rate of 2.2%, which may be the OBAMA era's NEW NORMAL but is far below what is POSSIBLE with the RIGHT policies. Even an average growth rate of 3.2% a year, which is close to the rate of the 1980s and 1990s, would reduce deficits and the debt burden substantially. This is where the tax burden comes in, and on that score CBO admits that "to the extent that additional tax revenues were generated by boosting marginal tax rates, those HIGHER rates would DISCOURAGE people from working and saving, further reducing output and income." So even the Keynesians who dominate CBO admit that there are costs in lower growth to the higher tax rates that Mr. Obama wants to foist on the country next year. As the fiscal adults like Paul Ryan and Tom Coburn often say, this is the most predictable crisis in history. If we wait for the bond vigilantes to strike, as in Europe today, the recourse will be painful spending cuts and destructive tax increases virtually overnight. The longer we extend Mr. Obama's legacy of slow growth and more debt, the greater the economic price to fix it. [Emphasis added]. Just as our federal government's sustained and reckless rampage of spending, spending and yet again spending money that we don't have is stampeding the body politic towards the cliffs of fiscal ruin--corporate irresponsibility writ large!-so, too, at the most basic level of society, the level of private citizen behavior, irresponsibility leads inevitably to disaster, to poverty and despair. Regrettably, now that the institution of marriage has become an endangered species-in certain sectors of our society it's all but vanished while its declining in the rest-the crucially important mission of fostering in the young a sense of responsibility, a sense of duty, a mission that traditionally has belonged especially to the father, is a mission increasingly abandoned as fathers disappear, much to the detriment of society and private citizen alike. All the more reason, then, to THANK GOD FOR AMERICA'S MANY GOOD FATHERS, who dedicate themselves to this all-important sacred duty of cultivating in their children, by word and example, a disciplined dedication to what is right. May God's blessing rest in abundance upon such fathers, today and throughout the year! A propos of the supreme importance of fostering in the rising generation the habits proper to responsibility, may I share with you these words of wisdom spoken in recent testimony (June 5th) before the U.S. Senate's Finance Committee by Ron Haskins, a Brookings Institution Senior Fellow. I want to emphasize the importance of individual initiative in reducing poverty and promoting economic success. Young people can virtually assure that they and their families will avoid poverty if they follow three elementary rules for success-complete at least a high school education, work full time, and wait until age 21, and get married, before having a baby. Based on an analysis of Census data, people who followed all three of these rules had only a 2% chance of being in poverty and a 72% chance of joining the middle class (defined as above $55,000 a year in 2010). These numbers were almost precisely reversed for people who violated all three rules, elevating their chance of being poor to 77% and reducing their chance of making it to the middle class to 4%. Individual effort and good decisions about the big events in life are more important than government programs. Call it blaming the victim if you like, but decisions made by INDIVIDUALS are paramount in the fight to reduce poverty and increase opportunity in America. The nation's struggle to expand opportunity will continue to be an uphill battle if young people do not learn to make better decisions about their future.